Use Your Arc Welder to Cut, Gouge, Chamfer, or Bevel! having to invest big bucks in an air-arc cutting equipment (or worrying about starting fires when using it out doors). ZENA NO-Gas arc cutting/gouging rods let you gouge, bevel, and cut metal without needing a 300+ Amp air-arc gouging/cutting rig or an acetylene cutting torch and bulky gas bottles. We can't convert your electrode holder to a plasma torch/plasma cutter but, for field maintenance work, these rods are the next best thing to having an oxyacetylene rig, air arc system, or a powerful plasma cutter with you in the field! Air or gas free metal working electrode -- for expedient and economical grooving, beveling, chamfering, and gouging without any special equipment. Reactionary flux coating creates high level arc blast and forms an electrically conductive "cup" for ease of arc re-strike. Multiple rod diameters available to allow you a high degree of control over the cutting process -- and to allow use of our cutting rods with small or large arc welders. Weight of Gouged Metal per Min. Fastest, most economical method of removing unwanted metal. 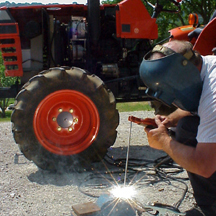 Uses a common arc welding machine. Saves hours of grinding and machining time. No special equipment required. Cutting can be performed Flat, Vertical Up, Vertical Down, Horizontal, or Overhead. Use AC or DC straight polarity. The electrode is pointed in the direction of travel, angled at a ten (10) degree angle, and the arc is initiated. For a shallow chamfer, the electrode is moved quickly along line of cut. A slower or weaving motion provides a deeper groove. The molten metal is pushed ahead as the chamfer is made. For cutting use a "sawing action". For deeper grooves, the procedure is repeated until the desired depth is achieved. Remove slag by chipping and brushing. Larger packs/quantities and other rod sizes available as special order items. Check our Product Specifications Section or our Online Store, Welding Supplies Section for current pricing or call our order desk (toll free) at 877- ZENA INC (weekdays from 9:00 AM to 5:00 PM CST). ® ZENA is a registered trademark owned by ZENA, Inc. for its welding systems and related products. © Copyright 2000-2018 by ZENA, Incorporated. All rights reserved.